This CCTV License Plate camera employs advanced high resolution 1080P in combination to the latest 1/3″ Panasonic Cmos image sensor which provides the best quality image day and night to capture license plate, resolution up to 1920 x 1080. This camera can record real-time 1080p resolution at 30 frames per second, so that you can liveview or playsback the video for amazing detail and superior recognition of faces or license plates. Built in 6~60mm Varifocal Auto Iris Lens which allow you to manually adjust the lens from 6mm to 60mm. At the wide setting of 6mm, you can expect to have a approximate 75 degree view. When you are zoomed in all the way at the 60mm zoom length, you’ll get a 10 degree view and be able to view up to 260ft IR distance. 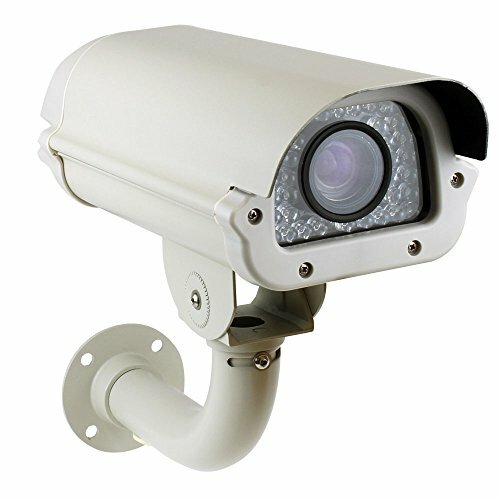 Designed for easy installation, this camera has a waterproof and vandalproof housing, fits in most indoor and outdoor installations. It is ideal for home or business use. Outdoor/Indoor security and surveillance IP66 waterproof & vandal proof camera with 36 Pieces high power IR LED, can clearly capture license plate up to 260FT IR Distance. It comes with 1 Year Warranty and Free Tech Support.